After what was officially described as six days of heated debate in the National Assembly, in early December 1992, amendments to Tanzania’s constitution were agreed. The Ninth Constitutional Amendment Bill which was eventually passed has cleared the way for a separation of powers between the Executive, the Judiciary and the Parliament. The Legislature was given power to impeach the President of the United Republic but came under considerable pressure from MP’s on two points. Firstly, many members opposed a provision which gave the President the right to dismiss the National Assembly at any point – something they regarded as undemocratic. They suggested that this should only happen when elections were due. Even more controversial was the decision by the Government to shelve a provision on the election of a Vice-President of Tanzania. The Prime Minister insisted on what was described as this ‘sensitive issue’ being postponed for 24 months because wore time was needed for study. Former Prime Minister Joseph Warioba warned that failure to see the Union (of Tanganyika and Zanzibar) in the context of the historical relations between the two sides could destroy the Union. He said that historical relations between the people of the two sides should be central when amendments to the Constitution were being considered. Some MP’s had wanted the President to have a sunning mate Vice-President but the Prime Minister pointed out that the President would be directly elected by the people. Under the present system, if the President is a citizen of Zanzibar then the First Vice president must come from the mainland. Referring to a number of inconsistencies in the Constitution the Prime Minister said that an expert team had been appointed to look into these. Once its report was ready it would be fully discussed. – Tanzania had remained an enviable island of peace and stability in a troubled continent, he said. Thanks to the good political leadership which had always been guided by a sense of social justice and thanks also to the sense of political maturity and tolerance of the Tanzanian people. “We have had incidents of ‘industrial unrest’ by doctors and nurses but this was under control”. “Our move from a one party to a multiparty system was not due to pressure from outside as is reportedly the case elsewhere. I do not need to go into the theoretical arguments about democracy, but I believe we were spared such external pressure for two reasons – one: our one party system was fairly democratic and very different from the East European model as we had free elections regularly; and two: our human rights record is comparable to that of any other democratic state. Of course we were also influenced by events else where, but that is different from pressure. We believe the essentials of democracy are universal, free elections, accountability of the government to the people, freedom of expression, respect for the Rule of Law etc. but that the format under which such democratic essentials are implemented can vary from country to country depending on the history and culture of the country concerned. – As you know, we became a one Party System as a historical consequence of our political development and not as a result of an ideological commitment to the one party system. But our Society has changed from what it was in 1965 to the present. We have more people now than in 1965 and the level of exposure to education among the people has increased. We have more complex social and economic problems and naturally therefore you may not have the same level of consensus that obtained 30 years ago on how such problems ought to be solved. Events happening in Eastern Europe and elsewhere in Africa also had an impact on our people. It was with such a background that Mwalimu and the Party in February 1990 encouraged the debate on a multiparty system and in February 1991 President Mwinyi appointed the Nyalali Commission to coordinate the debate and collate people’s views on whether to remain one party or to go multiparty. The Commission found out that, of 36 000 people they heard from, 80% preferred a continuation of the one party system and only 25% wanted a multiparty system. Because this was not a referendum, Nyalali recommended a move to a multiparty system, and the Party and Government accepted this recommendation. Why the Change to Multipartyism? Why did the Party and Government accept this recommendation for a multiparty system despite the fact that it had only 20% support? The answer is that reality had to be accepted, that society had changed, that there were people, though a minority, who wanted a change and that to deny the demand of such a minority might be a cause of instability because that minority would continue to agitate for change and the state would have to use force to suppress them. CCM itself has been based on a democratic tradition and has always responded to demands for greater democracy (in 1981 and 1984) and since the demand for multiparty was for greater democracy, it was in order to accept it. It was felt that this was the opportune time to initiate such a change when the Party still commanded the respect of the majority of the people so that the changes could be properly managed otherwise chaos would dominate the political scene as had happened elsewhere. 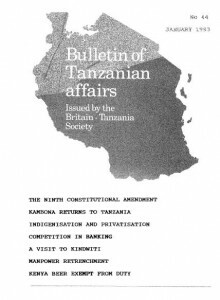 (i) The Constitution was amended to remove the articles which declared Tanzania a one Party State and which gave CCM a monopoly of political power and supremacy. (ii) The Registration of Political Parties Act was enacted – it provided conditions by which Political parties could be registered; parties had to be national in scope and to cover h t h mainland and Zanzibar – they should not be based on tribal, regional ethnic, religious or gender ideologies – they should have at least 200 members from each of at least 10 regions (8 mainland, 1 Pemba and 1 Zanzibar) It provides for a Registrar of Political Parties under the Prime Minister’s Office; for a two-stage registration process (provisional registration where a name, manifesto and provisional leadership is required; final registration after 6 months when the required number of members have been achieved). Parties can address rallies after provisional registration but can only participate in elections after final registration. (iv) Transitional legislation to validate the existing political structure; the CCH government duly elected in 1990 to remain until the next general election. The Registration of Political Parties Act came into effect on 1 July 1992 and since then nearly 20 political groups have acquired provisional registration. The multiplicity of small parties may be a cause for instability, not necessarily violent but it could bring about unstable coalition governments – the “Italian Syndrome”. We have to be aware that having many parties by itself is not a guarantee of democracy. Zaire has over 60 parties but it may not be more democratic than the UK with few parties. What matters is how people are involved in freely taking decisions on matters affecting their lives. Thus, in addition to allowing the formation of political parties, we have to emphasize the existence of free and viable civic organisations like local governments, Trade Unions and other mass organisations. We need to consolidate a new political culture of tolerance among differing political ideologies so that people may differ without resorting to physical street fighting. You take such a culture here in the U.K. for granted but we have to make special efforts to inculcate it into people’s thinking and behaviour. The concept of a “loyal opposition” is still a distant idea. There is a challenge to prevent parties from sliding into ethnic, religious or tribal orientation in practice even if in theory they appear national. We have to remind ourselves that having a multiparty system by itself is not a panacea for our economic and other problems and that we still have to work harder and better to make the economy deliver. By the same token, those of our overseas friends who wish Tanzania democracy well, have to assist us economically so that our people can see that the new political system can meet their expectations. Finally, there is understandable international concern for there to be democracy in all countries. Indeed, in the aid policy of many developed countries, democracy and human rights have become essential prerequisites, if not conditionalities, for a country to qualify for assistance. The time has now come when the need for democracy and social justice within countries must be matched by the pressure for democracy and social justice between countries. Answering questions, the High Commissioner said that Tanzania would be using the ‘first past the post’ system in its elections. So far not many differences had been revealed between the policies of the CCM and those of the other parties although none of the new parties were to the left of the CCM in ideology. At the CCM leadership elections in Dodoma on December 20th President Mwinyi obtained 1,311 votes out of 1,340 cast to retain his Chairmanship of the Party. Zanzibar President Amour got 1,296 votes out of 1,318 and was elected Vice-Chairman. 70 members (out of 292 candidates) were elected to the Party’s National Executive Committee (MEC) which had previously had 150 members, Party Vice-chairman Rashidi Kawawa announced his resignation, after more than 40 years in politics, ‘because of age and poor health’ President Mwinyi asked him not to build a fence round his house “because we want to continue drawing from your pot of wisdom”. The following day the NEC elected the Party’s 19-member Central Committee which now includes Messrs. Horace Kolimba (Secretary General), Paul Bomani (Treasurer), Kingunge N’gombale Mwiru (Publicity Secretary), Cleopa Msuya, Sebastian Chale, Pius Msekwa, Mustafa Nyang’anyi, ldris Wakil and Ben Mkapa. More than one million people have joined the CCM Party since the multi-party democracy was adopted last year, announced Party Secretary General Horace Kolimba addressing a huge rally in Mtwara – Daily News. The ‘Business Times’ published an 8-page supplement on October 30 outlining the personalities and policies of fourteen of the 20 parties provisionally registered. Three of the parties – UMD, CHADEMA and the NCCR were expected to move on to full registration in the near future. Mr Edwin Mtei of CHADEMA emphasised encouragement of large and small scale farmers through sustained provision of resources, inputs and training. He also said that if his party were elected to power they would abolish the move of government headquarters to Dodoma. He said the move was too costly far the nation. Chief Fundikira’s UMD party favours the restoration of the nine pre-independence provinces each with an elected governor and parliament, something which his critics say would destroy the unity of the nation. Party politics returned to Zanzibar with a bang according to “Africa Events” when the Civic United Front (CUF) held it’s first rally, “nothing like at had been seen in the isles since the late 1950’s, with an assembly of some 12,000 apparently committed supporters”. The CUF’s vice-chairman is former Zanzibar Chief Minister Seif Shariff Hamad who is still being charged with a criminal offence involving confidential security documents. The Rev, Christopher Mtikila, described as ‘the firebrand leader of the Democratic Party’ is serving a nine month jail sentence after being charged with holding an illegal political rally. The new parties will be able to take part in local government elections on October 31, 1993. The next Presidential election is due in 1995. Retired President, Mwalimu Nyerere, has made his views very clear. Addressing a press conference at his Msasani residence on December 2nd he warned that the current attempts to categorise Wananchi into indigenous people and others would wreck national unity. He said that the ‘gimmick’ was being used to sell the idea of privatisation but it smacked of racism and would lead to tribal and religious divisions. He went on to associate privatisation with Thatcherism and Reaganomics and said that the Government should find other means to sell the policy. Mwalimu said that such alien policies had brought turmoil in Britain and the United States which were now in serious economic trouble. On political pluralism Mwalimu expressed disappointment over the failure by any of the new political parties to articulate their policies which showed lack of seriousness. Having too many parties amounts to having none, he said. “I would be happy if Tanzania had two or three serious parties and, as a Tanzanian, I would support all of them. He maintained, however, that he was a socialist and would only be a member of a socialist party. He said the policies of any party or nation should not be secret. He stressed that CCM and all the other parties must say openly what they stand for, so as to give voters confidence. The Government is to lay off 10,000 workers before the end of this financial year under a manpower retrenchment programme. Minister of State in the President’s Office (Civil Service), Fatma Said Ali, said, on October 28th that the employees, whose list had already been compiled, were from 55 years old and above. To ensure that the exercise would go smoothly, the Minister said, a special committee would be established to take charge of the task. However, in some Government departments, new workers would be employed to fill vacant positions. She cited the Ministry of Education which has a shortage of 16,000 teachers and the Ministry of Health. The Minister said that under the second phase, some 28,000 would be laid off . These would comprise drunkards, the lazy, negligent, incompetent, the sick, unfaithful and uncommitted persons. Power supply in the country is likely to stabilise in the next four months following serious power cuts which damaged industry in September and October in Dar es Salaam. There have been improvements of water intake at the Mtera Dam and a donors8 commitment to finance importation of gas turbines with the capacity to generate 60 megawatts. There has been a gradual improvement in water level at the dam, following heavy rains which fell in November. Donor agencies have expressed concern, however, over TANESCO’s outstanding debts and have called for drastic measures to ensure that payment is made for electricity. TANESCO’s main debtors are the Government (mainland) and the Government of Zanzibar which owe them TShs 2.2bn/- and TShs 1.3bn/- respectively. President Mwinyi swore in on October 21 Professor Sarungi – the new Minister for Communications and Transport, Jackson Makwetta – Minister for Agriculture, Livestock Development and Cooperatives and Amran Mayagila – Minister for Health; Juma Hamad Omar became Deputy Minister for Defence and National Service, Ditopile Mzuzuri, Deputy Minister of Communications and Transprt, and S P Makame Deputy Finance Minister. President Mwinyi received on November 12, 1992 a report by the Commission on Land which had been formed two years ago. The report was presented to the President by the Commission’s chairman, Professor Shivji at Ikulu, Dar es Salaam. The report will be studied by the Government before being made public. Beer imported from Kenya is no longer subject to import and excise duties. However, this move has caused some concern. Demand for locally produced ‘Safari’ and ‘Pilsner’ beers has gone down rapidly and border regions are said to be flooded with foreign beer. Beer from Kenya is now selling at TShs 115 per bottle in these border areas compared with TShs 350 before, to the detriment of Tanzanian beers which are selling at TShs 300 – Business Times. Private businessmen are now being allowed to purchase cotton directly from growers. When the move was first announced there were strong protests from MP’s and, as a result, the Government agreed to rescind the decision, NOW, the Government has allowed businessmen to purchase cotton in areas where cooperatives fail to secure bank loans. Both France and the United States have recently praised Tanzania publicly for her efforts to bring peace in Rwanda. Following the publication of the Arusha Declaration on 29th January 1967 the foreign banks hitherto operating in Tanzania were nationalised and responsibility for commercial banking vested in the National Bank of Commerce on the mainland and the People’s Bank of Zanzibar on the islands of Unguja and Pemba. In June 9967 the National Bank of Commerce operated from 35 branches and total deposits amounted to TShs. 763 million. By June 1991 there was a network of 198 branches and 239 mobile offices accepting three times the volume of deposits in real terns. Growth of this dimension was in itself a remarkable achievement, but it was accompanied by serious and growing defects, which considerably reduced the bank8s ability to meet the demands made upon it for the purposes of economic recovery and development. The first problem was in part a result of the bank’s own phenomenal growth. While lending in the private sector (14% of the total loan portfolio) was well managed, private deposit banking procedures developed in the days of small scale banking proved unable to meet the needs of a rapidly growing and increasingly moneterised population. The result has been growing delays, poor customer performance, inadequate internal controls and an increased resort by the public to cash transactions. There are in addition special problems arising from the parlous state of the telephone system, which affects communications with branches using telex or fax, and postal delays caused by the unreliability of the overstretched air services, It is clear that there is in the immediate future no perfect answer to the problem of organisation. Nevertheless, it is believed that the introduction of computerisation combined with measures to improve staff skills and attitudes could greatly improve standards of performance. The tribulations of the commercial banks have, however, been compounded by circumstances beyond their control. Their role as an engine of development by financing economic enterprises has always been acknowledged, but the autonomy of the banks in deciding on the commercial justification for loans has been seriously restricted by the Government and the Party, who from time to time have insisted on loan facilities in loss making circumstances. The result has been the accumulation of bad debts which, in the case of the National Bank of Commerce, amounted in December 1989 to TShs 68,500 million. This access to loan finance for loss making parastatals, crop marketing boards and cooperative unions has acted upon these bodies as a disincentive to putting their own houses in order. Ss far as the National Bank of Commerce was concerned it has had the result that the bank was only saved from insolvency by the intervention of the Bank of Tanzania. Money creation for such purposes is a serious cause of inflation. Moreover, since the parastatals, cooperative unions and crop marketing bards accounted for 86% of outstanding bank credit, the bank’s ability to meet the needs of growth in the private sector was severely limited. In July 1988 President Mwinyi established a Presidential Commission of Enquiry into the Monetary and Banking System of Tanzania. The Commission, working under the chairmanship of Mr. C.N. Nyirabu, a former Governor of the Bank of Tanzania, submitted its final report on 19th July 1990. The report, which, unhappily, has not yet been published, was wide-ranging and covered the entire financial sector. Since the future performance of the banks depended on Government policy with respect to the crop marketing boards among other changes external to .the banks themselves, the Commission did not hesitate to offer advice in these areas also. Above all, the Commission called for a reconsideration of the role of Government in economic affairs. It recognised the Government’s overriding responsibility by the passage of laws and the provision of the institutional framework to determine the general character and direction of economic activity, but having set up the machinery and decided on the broad lines of policy it was the duty of Government to leave commercial decisions to the banks and other financial institutions each in their own allotted spheres of activity. The Commission recognised that the commercial banks could not operate effectively as engines of development so long as their loan portfolios remained encumbered by a very large volume of non-performing credits. Following the Commission’s advice, a Loans and Advances Realisation Trust (LART) endowed with powers as receiver and liquidator has been set up and all such loans, including assets lodged with the hanks as collateral, have been transferred to it. Outstanding among the numerous recommendations of the Commission was their belief in the benign influence that competition could have on the standards of performance of the commercial banks and other financial institutions. This opinion was shared by the Government and resulted in the enactment of the Banking and Financial Institutions Act 1991. This Act empowered the Bank of Tanzania to license any bank, including a foreign or joint venture bank, subject to the fulfilment of certain conditions, to operate in Tanzania. So far, only the Standard Chartered Bank has been thus licensed, though other applications are believed to be in the pipeline, It is understood that Standard Chartered was intending to begin operations in 1993 and that its operations for the time being would be confined to Dar es Salaam. Provision has also been made in the 1991 Act for foreign banks not intending to transact business with Tanzania to open representative offices, Hitherto only the Equator Bank has been authorised by the Bank of Tanzania under this provision. A decision on the recommendation of the Commission to divide the National Bank of Commerce into three separate banks is understood to be in abeyance. Owing to the overriding importance to Tanzania of the export drive, the Commission looks to the competing commercial banks to improve their procedures and to be innovative in their response to the needs of exporters. To this end they advise that the commercial banks should be allowed to hold portfolios of foreign exchange and be recognised dealers on behalf of exporters. It is hardly surprising that far-reaching changes of the kind recommended by the Commission are taking some time to implement. They are, however, of critical importance to the country as it struggles to surmount the daunting difficulties of economic regeneration, While it is unlikely that the recommendations of the Commission will be carried out in every detail, it has certainly performed a great service in its analysis of the serious problems affecting the financial institutions of Tanzania, The changes now in train are being supported by a World Bank Financial Sector Adjustment Credit. At Dar es Salaam airport on November 5th 1992 everything could not have been smoother. Pleasant atmosphere, changing the money, finding a taxi and so on. Straight out to Buguruni, and under a mango tree I found the house I was looking for. In fact, every house was under a mango tree. As I carried my bag across, all the little boys and girls as they passed said ‘Shikmu!’ (I clasp your feet), to which 1 answered ‘Marahaba’ (Thankyou). When I was here twenty-eight years ago, I was the one who used to say Shikmu, but then I didn’t have a long grey beard. On November 6th I woke up at 4.30 a.m. and listened for some sort of sound which might indicate that the driver had come to take me to the bus for Kindwiti, But it seems that he has a wife somewhere far away and was not expected to come until the following morning. The next day I woke at 5 a.m. and went with the driver to the bus. I got a seat, which was just as well because I sat in it for the next eight and half hours! The seat was comfortable, but the bus was inclined to jump up and down because the road did. We stopped, after possibly two hours, when there was a very loud mechanical noise. I think that the prop shaft came off and rattled along the road. People got out of the bus and someone had a very large hammer. Anyway after about twenty minutes the bus continued its bumping southward. In fact it is about 120 miles to Utete and the journey cost 1000 shillings. When we got there, I jumped out of the bus with great relief and contemplated how to get across the river. It was probably less than half a kilometre wide at the time and I jumped into a canoe, which seemed to be quite solid and safe. I thought I could probably make it to the other side. I landed and asked which way to Kindwitwi and someone with a bicycle offered to show me. When we got to the top of the slope he indicated that I should get onto the carrier of the bicycle which I did. Although this was possibly better than walking, it was also very precarious since there were no foot rests and I had my briefcase (which was all I had) balanced in front of me. After a kilometre of hard pedalling, we found someone else who was walking to Kindwitwi and I was handed over to this new guide. We walked on in silence and heat, and, after probably no more than another 3 kilometres, we got to the village. We went straight up to Canon Robin Lamburn’s house and there he was, sitting in the seat which apparently he always occupies, in his room in his house. He was having tea and the first thing I did was drink tea, until I had used all the hot water, which must have been about five cups. He has a system of using a strainer and pouring the hot water over the tea. It makes a surprisingly successful cup. Perhaps it was because he was using what must have been a fairly strong Tanzanian tea. We had landed at 2.30 p.m. and I got to the village at about 3.20 pm, which Robin seemed to think was a bit slow. I was shown a room; retired there for a brief rest and then returned for the evening meal. It consisted of rice, beans and fish. As there was no fruit, the second course was rice and honey, which I am very fond of. The problem with the fish was than they were rather small, and consisted of a large head, a large tail and a considerable number of bones in between. In fact I was able to find no more than a piece of skin which would just about cover a teaspoon, and even that seemed to be liberally sprinkled with bones. Anyway, Robin was his usual convivial self, and we followed the meal with tea or coffee. Robin has become very deaf. He has a little hearing aid but it seemed to make wee noises much of the time and was only of limited help. I found the best thing was to sit somewhere near the hearing aid and blast in its direction. Thus one could have a reasonable conversation. Breakfast consisted of the bread I had brought the previous day, maize porridge with some honey and canned milk and tea. Then we went for a walk around the village. Robin took me to the ‘ward’ where the remaining dozen or so leprosy patients are accommodated. These are the much disfigured ones who have little hope of a normal life and will continue to receive rations. There are many others in the village who do not need special facilities but who continue to need treatment since the cure takes two years to complete. We saw a school, the clinic and the library, and met numerous people. Got back about half way through the morning. Robin normally has a morning snooze and then is OK until lunch time; a further snooze until 3 p.m. when tea appears. I was happy to have a rest and read my book. It is extremely humid and that makes it quite difficult. I found another place to shower because the shower behind the guest quarters and Robin’s one consisted of some rather flimsy reeds which could keep the eyes of casual bystanders out, but the facility consisted of a bowl of water and a cup with which to pour it over oneself. My shower had a 44g drum set up above which was filled daily with water and you could have a real shower. In the cool evening and by moonlight this was really very pleasant and refreshing. The Rufiji Leprosy Trust is already thinking about what it will do when leprosy is eliminated as a major problem hopefully, by the end of the century. It could be TB, AIDS, or other things. They have recently reduced or cut rations to former patients who are now able-bodied and can fend for themselves. The avoidance of a dependency attitude is very important and that is very much their aim. Robin objects to giving out cash but when asked to contribute to funerals and such like things, is a soft touch. He walked me back to my house because I didn’t know which way to go and was rather nervous about meeting lions on the way. During the night there was considerable activity in my room. It could have been birds on the roof; rats playing around in the area above the door; bats doing their thing.1 am sure it is not what my host’s predecessors experienced; they used to leave the door to the sitting room open at night so that the dogs could get in and out at will. They woke up one night to hear the dogs screaming; opened the bedroom door and came face to face with a leopard. It was so scared that it dropped the dog and ran away. Breakfast, and then a walk down around the riverine agricultural area. They are trying to stop the banks of where the river comes to when in flood from collapsing by planting trees. I suggested that Vetiver grass might help as well and apparently it is available in Tanzania. Farming must be pretty difficult. There are hippos and pigs to contend with as well as many of the usual pests and diseases. Everything looked pretty dry and miserable as it was some time since the rains. Lunch, rest, tea. Then I went down to the lake behind Robin’s house. I think it is an old branch of the Rufiji. Some people had been trying to grow vegetables down there, but the problem was water. It had to be collected in buckets from the lake, and apparently the water was getting more and more salt, so the people had given up. By the way, the water we drink at table is like mineral water. There is a boiling natural spring near the lake. Very tasty it is too. In the evening another meal with Robin, including a chicken. At one point – I think Robin was possibly negotiating the purchase – a small chicken flew in through the door, rushed across the room jumped up onto Robin’s head and flew out through the window. Robin’s house consists of three rooms; the Holy of Holies, which is his room; the kitchen; and, the sitting room in which were to be seen an astonishing number of books, many of them of great interest, but deteriorating in condition because of climate and insects; Robin’s M E certificate; the Queen’s signature having survived the depredations of paper-eaters. Also various crosses and other things, mementoes of a long life. I would think that in spite of the hardships of his situation, he is probably very happy and entirely content to remain at Kindwiti. He has an extremely important function to perform, because although young people come and go, Robin goes on for ever and provides the continuity ……. The World Bank Mission in Tanzania has issued proposed guidelines for what was described in the BUSINESS TIMES (December 4) as a programme for Government withdrawal from the running of economic enterprises. The Bank was said to consider that the programme would be a formidable challenge but could bring Tanzania to the forefront of the process of ‘divestiture’ in Sub Saharan Africa. According to the guidelines, more than half of the regional cooperative unions would be liquidated, most regional trading companies would be auctioned and many regional transport companies would be sold by tender. Only the Tanzania Cigarette Company and the Mtibwa Sugar Estates would remain relatively unchanged by the privatisation exercise because they are scheduled to make part of their shares available to private investors. Air Tanzania Corporation and Tanzania Breweries would undergo partial trade sale. Several other good performing companies would be subject to full trade sale including MECCO, the Friendship Textile Mills, National Pharmaceuticals, Williamson Diamonds, Tanzania Distilleries, Minjingu Phosphate Company, Sabuni Industries, Mwanza Textiles, Tanzania Sheet Glass and Nyanza Glass Works. Enterprises scheduled for sale by tender include Darbrew, Tanzania Hides and Skins, National Steel Corporation, and the National Engineering Company. Several other enterprises would enter into a lease of assets – Musoma Textiles, Morogoro Polyester Textiles and Southern Paper Mills. Enterprises scheduled for liquidation include the Tanzania Shoe Company, Tanita, Rubber Industries and Tanzania Instant Coffee. Joint venture arrangements are already under way in the case of the New Africa Hotel, Tanzania Railways Hotels, Tangold Products Ltd and Landrover Tanzania Ltd.